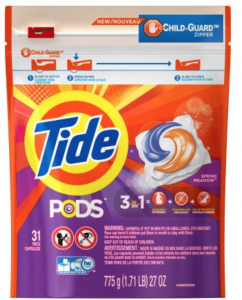 Dollar General: Big Bags of Tide Pods, Downy & More For ONLY $1.97 – HUGE SAVINGS !!!! Score big at Dollar General this week On Huge bags of Tide Pods, Downy and other P&G products this week. How will the 5$ come off instantly? What triggers it? It’s a p and g deal. Is the P&G instant savings advertised in the flyer? How does it jump from pay to final price? He’s taking the final price divided by the 4 products purchase. The 1.97 is the final cost per item. I just found a dg digital store coupon for $5 off purchase of $25+ pretax at dg store calculated after all other dg discounts. Will subbing the downy infusions instead of the unstoppable still trigger the instant $5 off? Where do you find these? ?